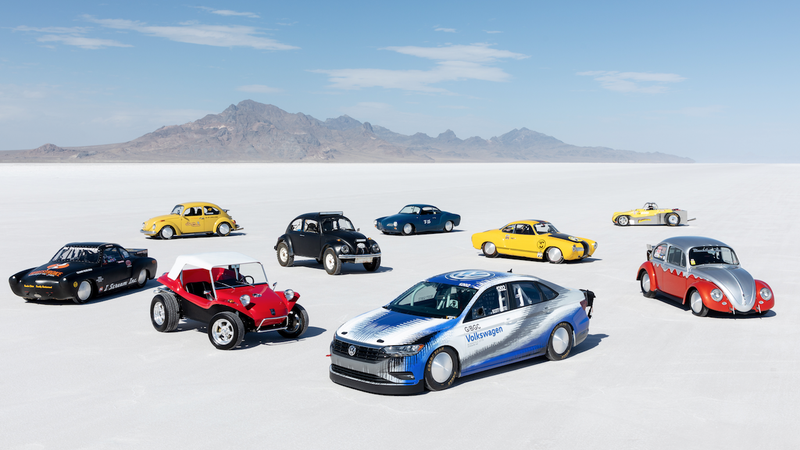 The whole reason Volkswagen flew me out to the Bonneville Salt Flats was so I could, ideally, witness their specially-prepped 2019 Jetta beat the speed record for the Southern California Timing Association’s (SCTA) Blown Gas Coupe (G/BGC) class record of 208.472 mph. They did, making an impressive 210.16 mph—but they did it after I left, so I didn’t get to see it. Oh well. Luckily for me, it didn’t have the one they needed, so I was still able to get back to the airport. The takeaway here is that setting any kind of speed record like this is not easy, at all, even with VW’s resources behind you and a talented driver and crew. The Jetta’s EA888 engine started life bone stock, but THR Manufacturing tweaked things pretty significantly, replacing the connecting rods, pistons, valves, camshafts, turbocharger, and exhaust system with new parts designed for high-power racing applications. The result was an engine that dyno’d at 600 horsepower at 8,500 rpm. That’s one helluva Jetta. In the end, though, they pulled it off, overcoming the plug-fouling fuel issues and the other small things that stood in their way, so, good work there. Now we all know the fastest Blown Gas Coupe is a Jetta, at least according to the SCTA. It may be a very specific record, but it’s still a record.